This pillow is 12" x 12" - yours can be larger. My "logs" range from 7/8" to 2 1/4" wide but all of your strips could be the same width. My starting square is 3" x 3" placed in a corner. Your square could be larger, or placed in the center, or both!. 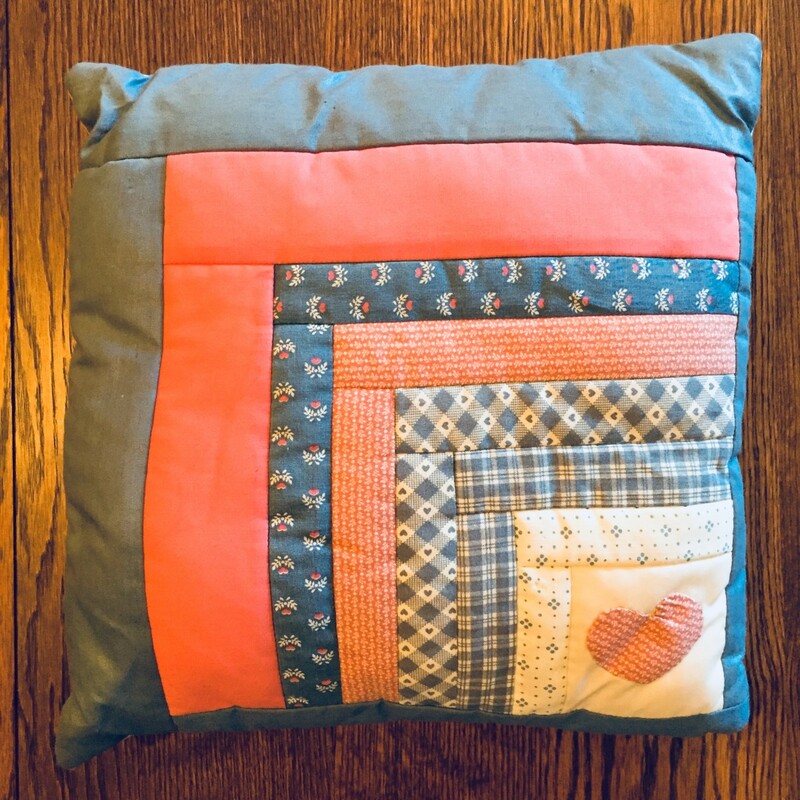 A log cabin square can become a finished pillow of any size or the start of any size quilt—you decide! Use scraps from home-made items, cut up a favorite garment that no longer serves its purpose, or purchase coordinating fabric to match a sofa. If you choose to make a pillow, decide if you want to adhere to a pre-made pillow form, or let your fabric dictate the size and stuff the finished pillow with loose batting. 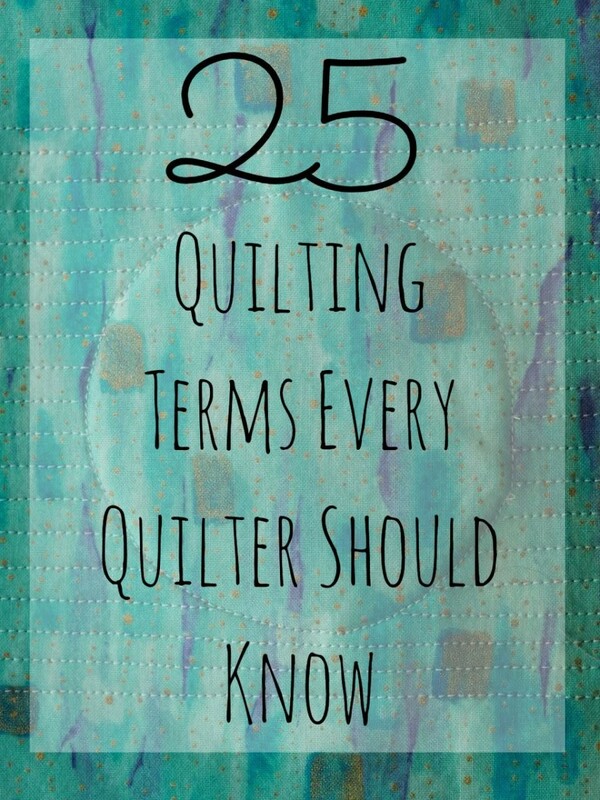 If you choose to make a quilt, decide on the size of the quilt, then decide how many squares you want to make for that size. For instance, if you make 12" x 12" squares you will need more squares than if you make 18" x 18" squares for the same size quilt. 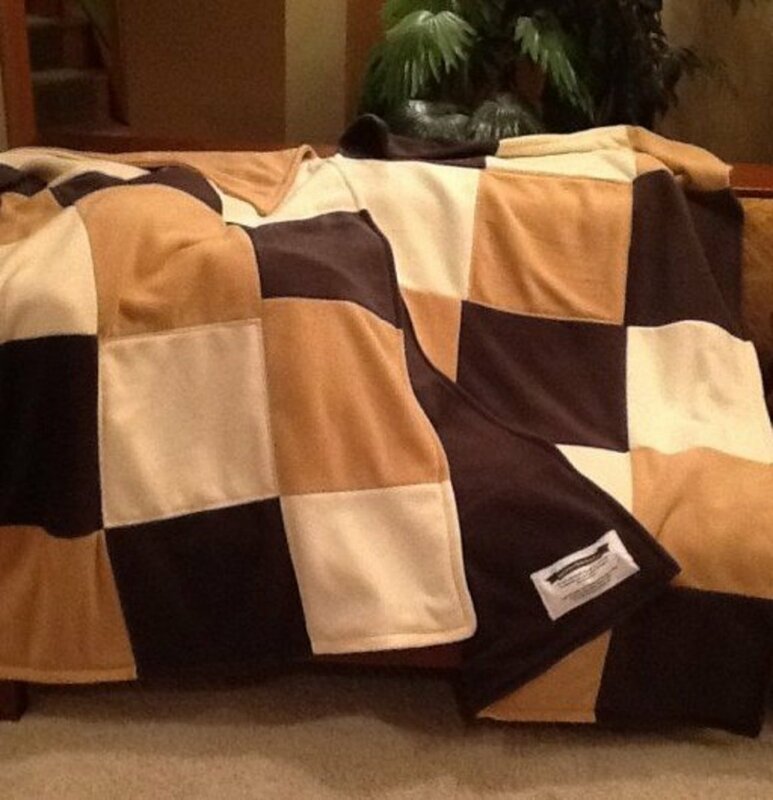 A 72" length would need 6 of the 12" squares, but 4 of the 18" squares. Also, consider the width of your strips (logs). They can be narrow, wide, or mixed. For a single log cabin square, it's easy to cut your strips with a pair of scissors. For 2 or 3 squares you may be able to stack your fabric and still cut with scissors. 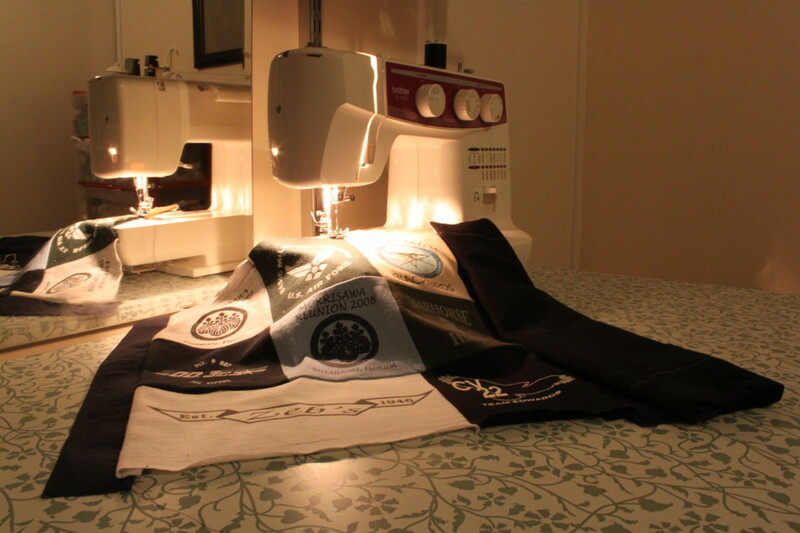 For many strips, you may want to use a rotary cutter against the folded fabric. Each strip needs to be long enough to lay across the preceding square. I suggest cutting all strips the full length of your fabric and trim them to size as your square enlarges. Always include width for your seam allowance. If you plan on a 1/4" seam allowance include 1/2" added to your width. If you plan on a 1/2" seam allowance include a full 1" in your width. 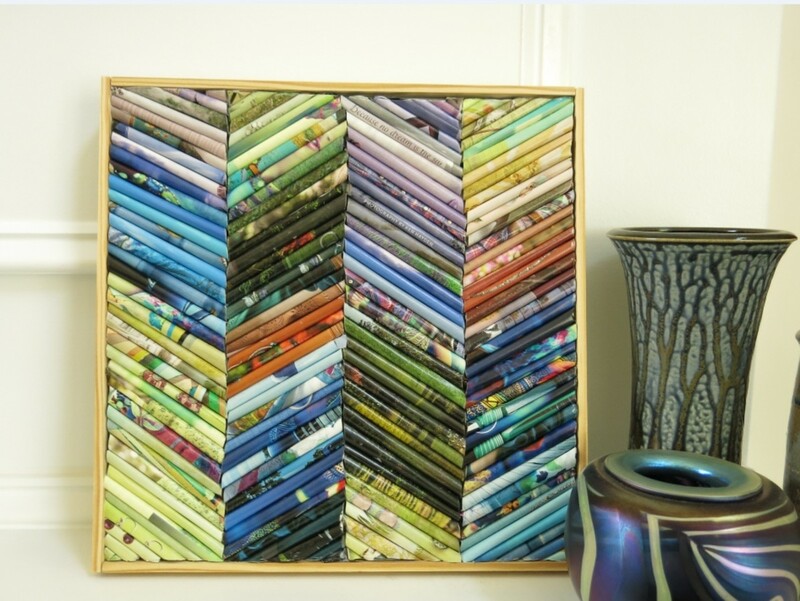 For the 12" x 12" pillow above, my strips range from only 7/8" wide to 2 1/4" wide. Yours can be all the same width or vary by row. My starting square is 3" x 3" placed in a corner. Yours could be larger or placed in the center. This can be stitched with either a serger or regular sewing machine. Be aware that the seams from a serger will be slightly bulkier than the seams from the straight stitch of a regular sewing machine. Start with your first square. (You may want to appliqué a design on it as I did). Choose your first strip of fabric and place right sides together. 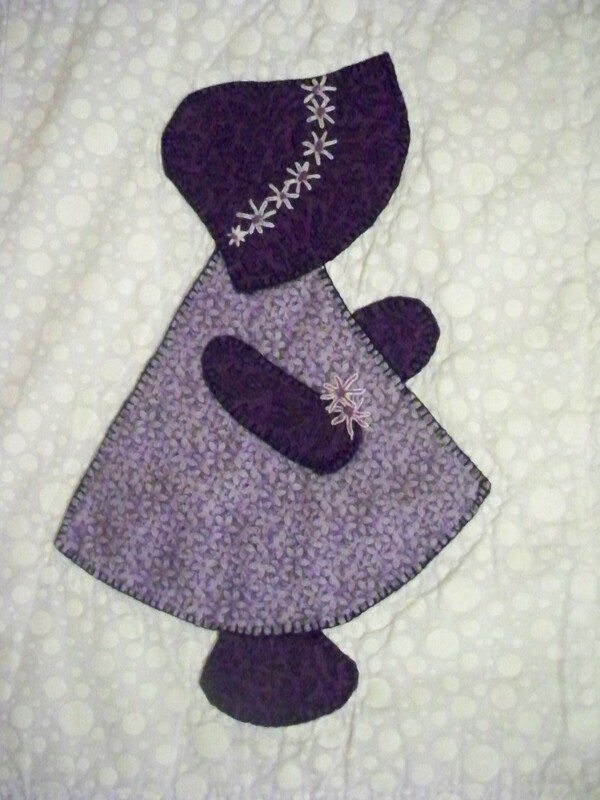 Sew them together with the seam allowance you have planned for - 1/4" or 1/2". Trim your strip even with the edges of the square. For a really nice piece, press the seam allowance flat from the wrong side using a dry iron. Steam may distort the fabric. Your initial square has become just a bit larger, and a little lop-sided. Sew this strip across the square and the strip which is opened flat. Trim this strip even with the edges of the new square. Continue adding strips, trimming, and pressing until you have finished the size of the piece you want. If you are making a pillow, stop when your size is met. 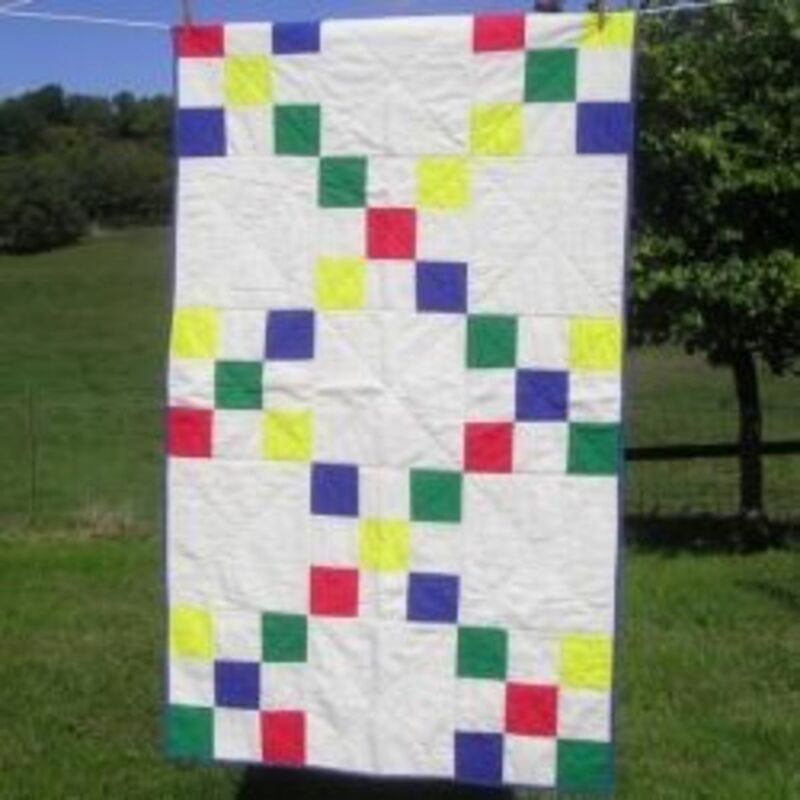 If you are making a lap quilt or a king size quilt, continue making "log cabin" pieces until you have the required number of squares. The back of the pillow can be any fabric and any color you choose. Cotton, polyester, or a blend of both work well. Denim or chambray may be a good choice for a boy's pillow. Fleece will be snuggly. I used a plain muslin. Cut your backing an inch larger than the front of the pillow. Place right sides together and sew, considering the points below. 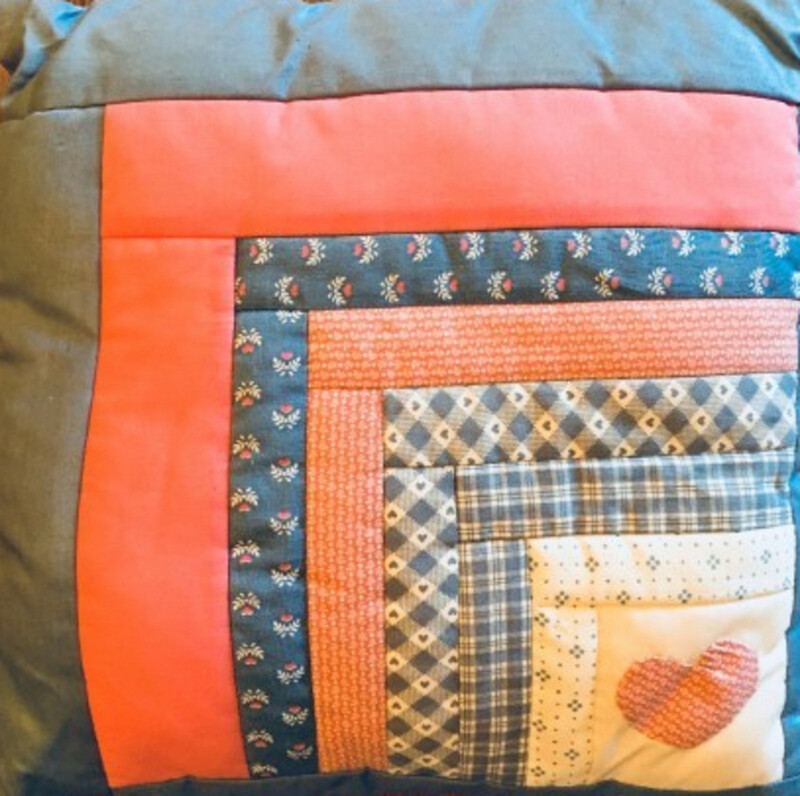 If you are using a purchased pillow form, sew only three sides together, leaving the bottom open. Gently work the pillow form into your fabric. Hand stitch this side closed. If you are using poly fiber fill as I did, sew three sides and part of the fourth, leaving enough room for your hand to insert the loose batting - at least four inches. Hand stitch this opening closed. Make as many lob cabin blocks as required for the size of quilt you are making. You may decide to put a border between individual blocks, or maybe between a cluster of four blocks. 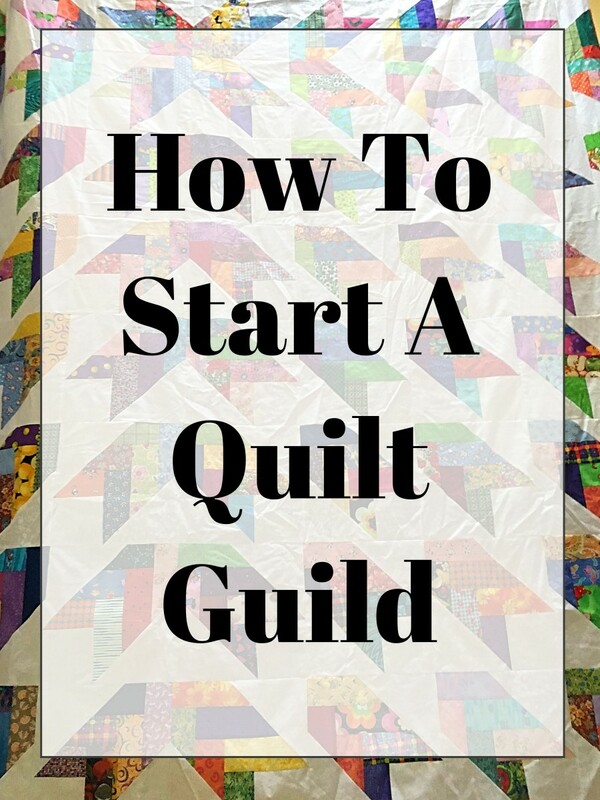 You may want a border to add an additional color or to bump up the size of the quilt without making more blocks. You can also place block against block. Anything that is visually appealing to you is exactly right. Arrange your squares in a way that pleases you. Here are a few ideas, but anything you like is perfectly fine. You may even want to put an additional border between your groupings as an added color accent or to make the correct size when finished. 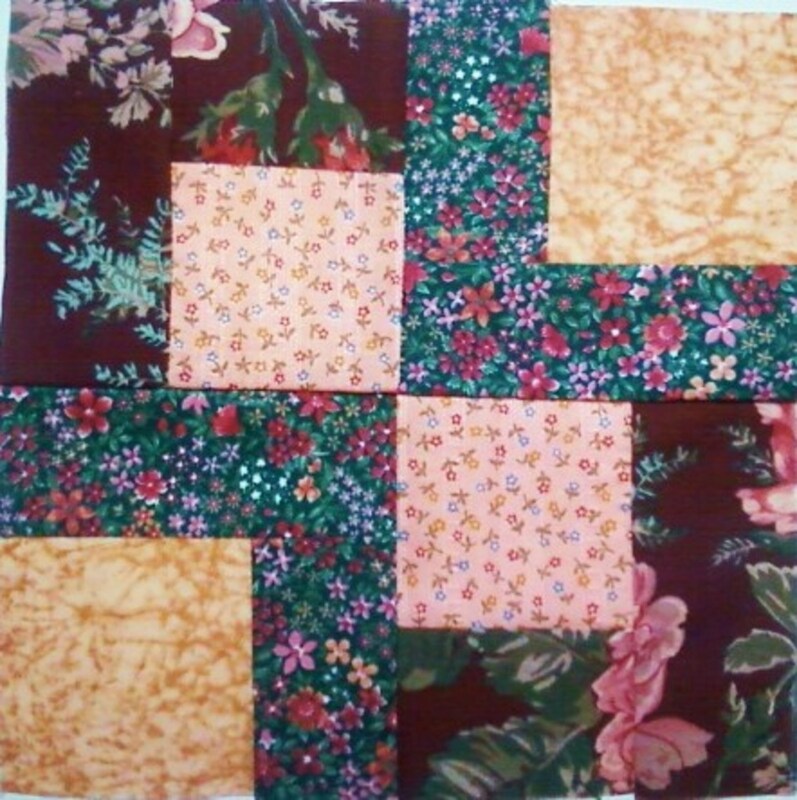 These three arrangements suggest a border strip between Log Cabin squares but they are not necessary if you prefer them directly next to each other. Your beginning square (mine with the heart) can face any direction you like. You can arrange your blocks in many ways. I gave examples of three ways. I have the beginning square towards the middle, all facing to the lower right corners, and all facing to the outside corners. I have indicated borders in the pictures above. Use your own ideas and arrange your blocks however you like. Whether a pillow or quilt, gift or personal use, have fun experimenting with colors and sizes on this project.